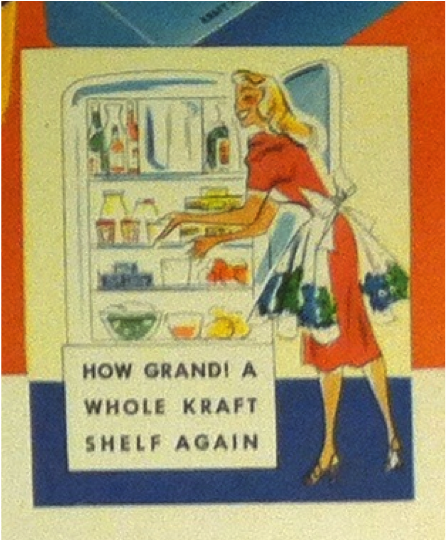 Archive Adventures #2: Wartime, Memorial Day … & Kraft American Cheese? With the tagline, “Hanker No More!” this advertisement from my archive adventures at the Hartman Center for Sales, Advertising & Marketing History at Duke University celebrates the return of not only America’s World War II heros, but of Kraft cheese products, like Kraft American cheese, Velveeta, and “Old English” Pasteurized Process Cheese, which were rationed on the home front. 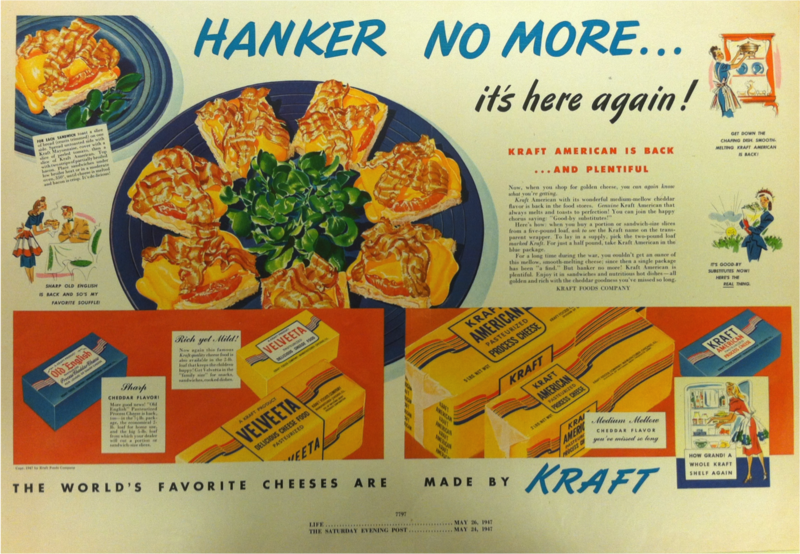 This “Hanker no more!” Kraft cheese advertisement ran 67 years ago this week in The Saturday Evening Post on May 24, 1947 and in Life Magazine on May 26, 1947. Ad copy commiserates with America’s housewives: “For a long time during the war, you couldn’t get an ounce of this mellow, smooth-melting cheese; since then a single package has been ‘a find. '” Now, however, the “cheddar goodness you’ve missed so long” has not only returned to supermarket shelves, but “is plentiful.” Furthermore, while an ounce was once impossible to procure, Kraft American cheese could now be purchased in a five-pound loaf or by the half pound (packaged in blue) if preferred. Such linguistic comparisons of weights and measures reveal some evidence of the food industry’s post-war aim to not only find domestic markets for wartime goods, but to increase consumption more generally. 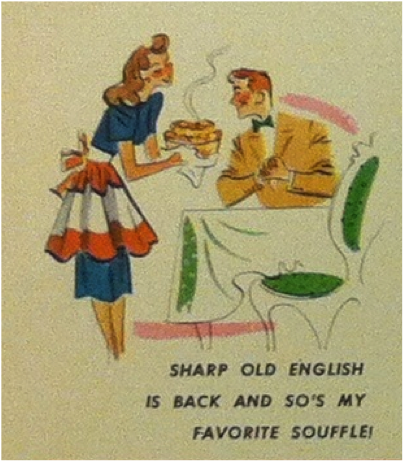 Finally, nearly all of the other advertisements that I collected for Kraft cheeses during the 1940s and 1950s simply depict the cheese products themselves, perhaps with a bodiless hand positioning foods on a plate. 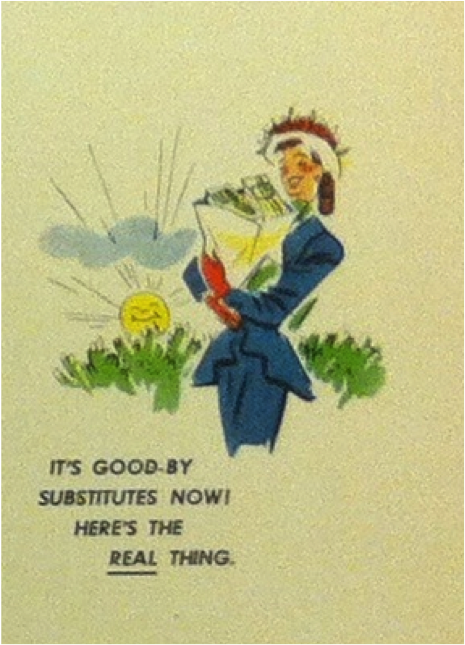 This particular ad includes four images of women altering their domestic activities due to the return of Kraft cheese. 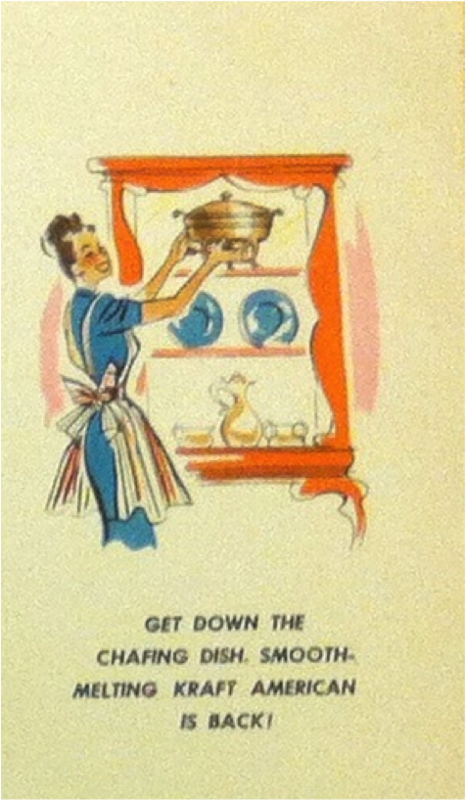 One (image 1 below) depicts a housewife at home in her apron, reaching up to the top shelf of her china cabinet to “get down the chaffing dish,” because “smooth-meling Kraft American is back!” Another (image 2) pictures a woman outdoors, returning from grocery shopping, bidding a happy good-bye to cheese substitutes and a welcome hello to “the real thing.” A third illustration (image 3) portrays a woman before her open refrigerator, stocked full of food, including “a whole Kraft shelf.” A final vignette (image 4) shows a woman serving a man, most likely her husband, a piping hot souffle, a dish made possible by the return of “sharp Old English” cheese. For each sandwich, toast a slice of bread (crusts trimmed) on one side. Spread un-toasted side with Kraft Mayonnaise, cover with a slice of peeled tomato, then a slice of Kraft American. Top with two strips of partially broiled bacon. Place sandwiches under low broiler heat or in a moderate oven, 350 degrees, until cheese is melted and bacon is crisp.